Allows to minimize/maximize/restore the window on demand. Allows to disable/enable minimize button, maximize button, close button, and window movement. Allows to override behavior for when minimize/maximize/close buttons are clicked. It is available for free via itch.io; Some examples of uses follow. Which is what you would run when the button is clicked and the game should be minimized. To re-enable the close-button, you would call the same function but with true as second argument. Note that while this will disable closing the game via the button or Alt+F4, tools like Task Manager would still work, so you should only use this to hint that current operation should not be interrupted. 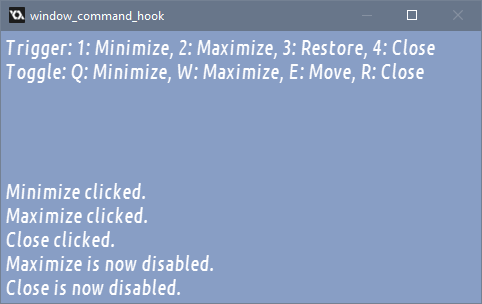 window_command_hook overrides the given command (in this case, close-action), instead changing an internal variable. Then, when window_command_check is called, the variable' state is returned and it is reset, meaning that the function will return true once after the act. So in this case, when the game detects that a close-button was clicked, it displays a yes/no dialog and closes the game if the user clicks "yes". Enter fullscreen mode on "maximize"
Oddly enough, this is what the extension was originally made for - utilizing the "maximize" button in an otherwise-not-resizeable application window to allow the user to enter full screen mode in a click. The logic is much akin to what was shown before - the button is enabled and hooked. Then, when it is clicked, the game enters the fullscreen mode. This is honestly a pretty simple extension that only does a few things, but does them well. “Let the game window always stay on top”? tanks. Added a function for that to this extension. Great to have when you want to do http requests before the game end, when the player click the close button.